ClickInText Text, Native, Banner advertising network details. 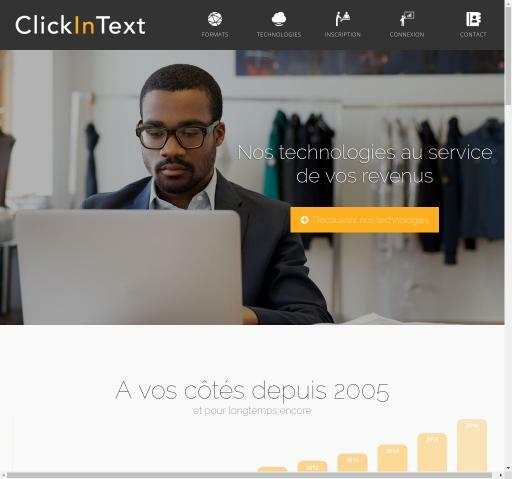 ClickIn Text is a French advertising company that values the end-to-end experience and provides all media compatible ads. With a broad experience of almost 15 years, ClickIn Text combines some essential elements in order to achieve their customers’ goals. ClickIn Text ensures your Brand’s safety by constantly analyzing your pages and prevents fraud by anticipating and blocking any doubtful activity. The platform is also using retargeting, which means that the visitor will get multiple ads during the website visit, depending on the target and customized advertisement. For additional information before registering on the ClickIn Text platform, see the Information section to find out what Pricing Models they offer, which are their Targeting Options and Advertising Formats.